After exploring the various stitches on TAST challenge, there is another interesting stitch challenge on Queenie’s blog. She is conveniently posting the stitches which were not part of the TAST challenge. A fine way to explore some other stitches. This idea was on my mind for some time, to explore the stitches from various books. Queenie is doing that now. It is like reading a book. Visit her blog to know more about this venture. The first stitch- Anundsjö stitch is an easy one to start. It is hard to type the word, so it is just copied! There is another name for it- detached split stitch. This is the first time I have seen or heard of this stitch. 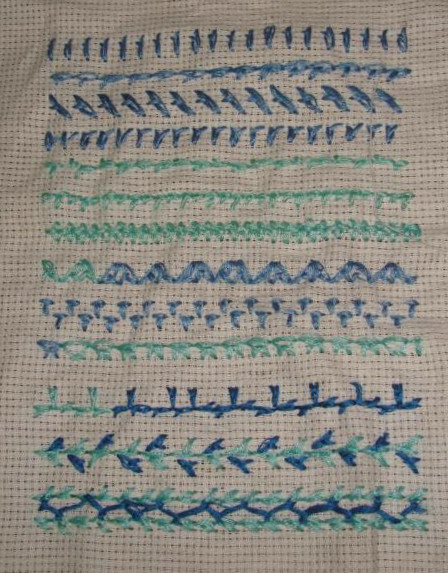 The sampler started with the individual stitches, then the same stitch is worked as linear stitch, the third row is an angled version of the individual stitches and in the last row, the securing stitch is worked at an angle. The picture is not very clear. Started this stitch as linear stitch in the first row and working the securing stitch on both sides alternatively. This gives an effect of barred alternative chain stitch. The long and short version of the securing stitch is worked in the second row. Each securing stitch is ended inside the previously worked split stitch in the last row. The zigzag version of the stitch is worked in the first row. When the stitch is worked horizontally and the secure stitch is taken down vertically, it gives a T shaped stitch. This can be used as filling stitch also. The split is made by pulling the stitch from two points in the last row. The detached split stitches are worked in three directions, the same treatment continues on the first row. The second row is an inspiration from Queenie’s project on this stitch. Two rows of this stitch are connected by another decorative stitch in another colour in the last row. I enjoyed working on this stitch sampler. Easy stitches lend themselves to more explorations. The full sampler.